It says a great deal about just how very brave this season of Doctor Who has been that, for a moment near the end of “Closing Time,” I actually thought this episode just might dare to abruptly shift tones: from light, comic-relief respite to dark, thematically-heavy tragedy. After repeatedly berating himself for not leaving well enough alone, and after confessing that he is a “stupid, selfish man” who puts people in danger, the Doctor watches in horror as a Cyberman helmet closes around the head of his friend Craig (James Corden). I can’t help but wonder if there isn’t somewhere—perhaps locked away in a drawer in Steven Moffat’s office—a version of this script where the Cybermen actually kill funny, lovable Craig, orphaning baby Alfie and reinforcing the idea that the Doctor brings death wherever he goes. It would have been one of the darkest moments in Doctor Who history, but it would have been the perfect thematic climax to a season that has seen the Doctor grapple with how he endangers and traumatizes the people he loves. The Doctor’s sad, resigned acceptance of his fate—and his willingness to go face his own death next week—would have assumed an air of tragic inevitability. As it stands, of course—and quite rightly—this season’s penultimate episode does not go quite that far. “Closing Time,” written by Gareth Roberts as a sequel to his 2010 story “The Lodger,” gives us a welcome breather between the emotional sturm und drang of the previous two entries and next week’s grand finale. More than that, however, the episode provides a turning point for the season: instead of piling still more guilt on the Doctor, Moffat and Co. begin to shake off the cumulative darkness of the previous few episodes, and start moving us back towards a more joyous, edifying vision of the Doctor we know and love. “Closing Time” turns out to more enjoyable for its small moments than for its large: the Cybermen serve as a bare-bones plot device here, but the real heart of this episode is in the interactions of its characters. Last year’s “The Lodger”—which occupied more or less the exact same place and function in the season—was something of a dark horse triumph, owing to the great chemistry between Corden and Smith and the comedic gold Roberts mined from placing the Doctor in a domestic situation. The decision to return to the premise this season may have simply been a desire to recapture that magic, but the episode also works to advance—even re-direct—the emotional arc of the Doctor’s story. What “Closing Time” provides—apart from some much needed comic relief—is a thematic turning point for the season, and a partial restoration of our faith in the Doctor/Companion relationship. If Craig had died at the hands of the Cybermen—losing his humanity to the monsters of the Doctor’s life—we would still be moving in the same downwardly-spiraling direction we’ve been swirling all season: towards the despairing conclusion that the Doctor is better off alone. Instead, Craig’s humanity turns out to save the day, after the Doctor has run out of ideas: this is the function his companions have served at least throughout the modern era, and particularly throughout the Moffat era. (“I believe in you,” the Doctor says to Craig, and through Craig to all of humanity. “I’ve always believed in all of you.”) Craig, in turn, reinforces what we know to be true: “He needs someone. He always needs someone. He just can’t admit it.” By surviving, and thriving, and being grateful for the Doctor’s presence in his life, Craig provides a necessary, equally valid contrast to the darker experiences of Amy and Rory, and begins moving us back towards the notion that the Doctor/Companion relationship can be a joyous one. 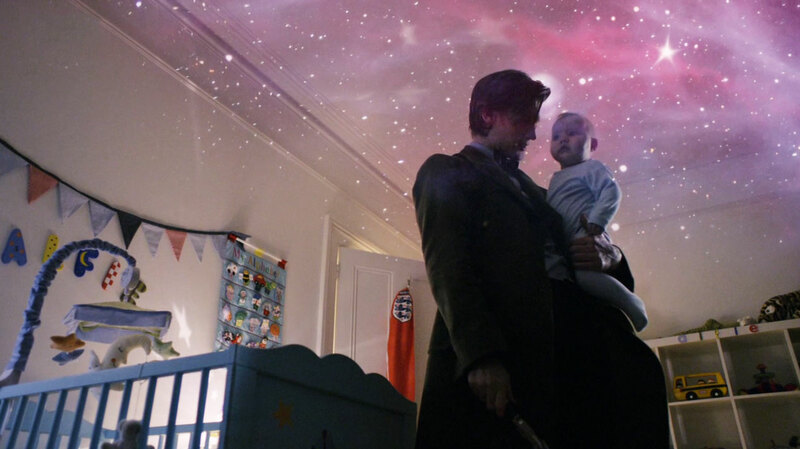 From his very first meeting with little Amelia Pond, the 11th Doctor has always had a special relationship with children. (“Is this how it works, Doctor?” Amy observed way back in their second adventure together. “You never interfere with the affairs of other people or planets, unless there are children crying?”) It’s a nice touch that the Doctor spends so much time this episode interacting with little Alfie, and a lovely grace note that the last thing he does before going off to face his death is to summarize his life in a short, valedictory speech to some children in the street. 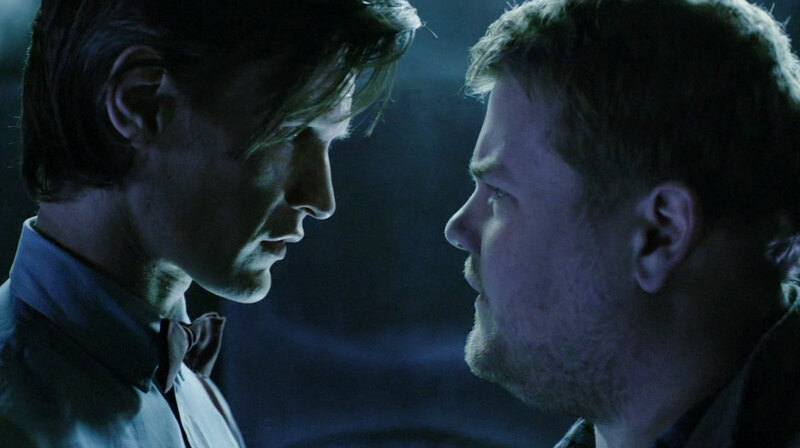 Am I the only one who assumed that James Corden’s appearance this season would tie into the overall story arc? As many people have observed, the makeshift TARDIS that the Doctor discovered last season above Craig’s flat in “The Lodger” sure looks like the same technology that the Silence had in “Day of the Moon” this season. It’s going to be very odd if that, too, turns out to be a coincidence. The wonderful scene with the Doctor monologuing at Alfie’s cribside about his impending death is a lovely call-back to the similar scene, at Amelia’s bedside, in “The Big Bang.” And in both scenes, 28-year-old Matt Smith manages to put at least 900 years of age into his performance. Speaking of age: has the Doctor, off-screen, already lived those 200 extra years that were unaccounted for when he met his death on the beach in “The Impossible Astronaut”? Or will we see how he spends those centuries next week? Just as the Doctor gets his Stetson this episode—coming full circle to the season premiere—so does River get her astronaut suit. Yet why do I have a sneaking suspicion that there will still be someone else looking out from the visor by the time we see the Doctor’s death again? Just as it turned out to be Amy in the Pandorica at the open of “The Big Bang,” I have a hunch Moffat has a few more sleight-of-hand tricks with which to dazzle us. This episode is really a fun, lighter breather between the dark episodes and the finale that all of us are waiting for. 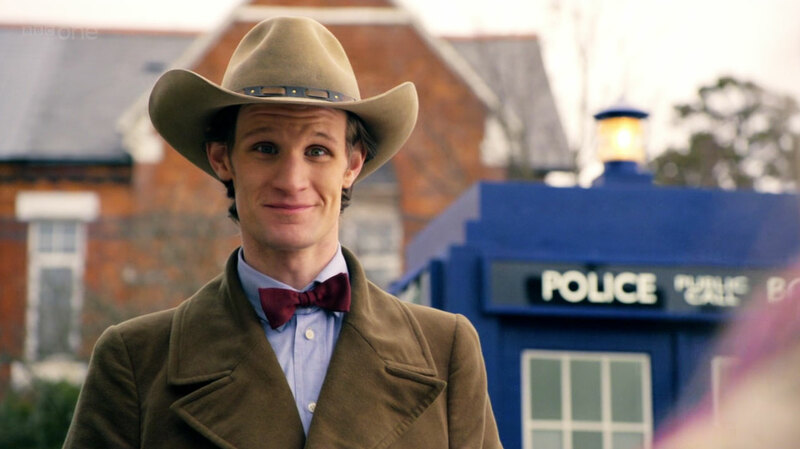 It’s not as emotional and sentimental as the last two episodes, but we can see our hero doctor back. And for the fact that we can’t have dark stories all the time, it would be too sad for the Doctor. But in fact, I am posting a comment here now, as the season is about to end, is to thank you for writing all these great and insightful critics. I read your critics after every episode, and until then, the journey is not over yet. You elaborate every observation that we might have noticed, but have not tried to deeply understand. And you link up tiny ideas and arcs from different episodes, so as to for us to enjoy the whole picture, and to admire the abilities of the writers and producers behind. Just an appreciation for your work. Thank you, Claud, you made my day. Doctor Who is so much smarter and more complicated than it appears, and I enjoy making the connections. It’s really nice to know my long, obsessive, overly-analytical reviews are appreciated by someone. Thank you for reading, and for taking the time to comment with your kind words. Enjoy the finale this week, and let us know what you thought of it.